Do you imagine how powerful testimonials can be for improving your sales? When Amazon first came up with the concept of public product reviews back in the year 1995, a lot of people actually thought it was merely a waste of time. However, they were largely mistaken and by now, we can’t afford to buy a product online without reading the various reviews that are convincing enough. Testimonial Reviews are vital for any type of business in 2019. Here are Five of the Best WordPress Testimonial Plugins in 2019. The Thrive Ovation Plugin is one of the Best Testimonial testimonial management plugins for WordPress with comprehensive functionalities. Most importantly, it allows you to manage all the various testimonial at one place no irrespective of the stage and size of your business. Also, it only takes a click to display the testimonial in the most visually appealing way. Most importantly, a lot of businesses have experienced a stunning improvement in their sales ever since they started using this plugin. When I tried this plugin on one of my sites and closely checked all the features, I realized what a powerful and advanced blend of features this plugin offers. This is the reason I choose to keep it in the first place in this post. 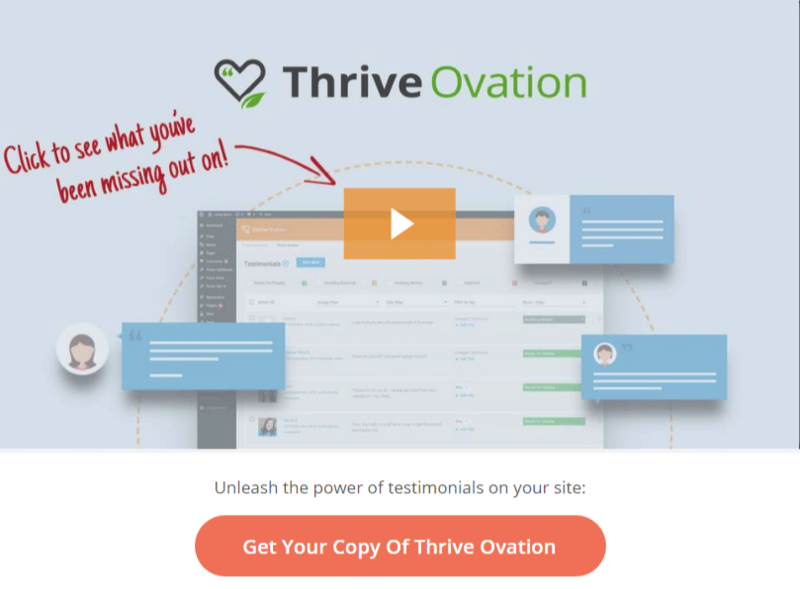 The Thrive Ovation allows you to send an approval email from within your WordPress dashboard and it keeps the testimonial in “Awaiting Approval state” until it is accepted. Most importantly, you can insert your testimonials anywhere you want through the Thrive Architect or by using shortcodes. With the 30 Days Money Back Guarantee, you can cancel your plan anytime with 30 days from your purchase and get your money refunded just in case you don't need it for some reasons. The WP Customer Reviews is another extensively used Best WordPress testimonials plugin and as a matter of fact, it is actually a free plugin. It sets up a page on your website to collect your customers’ reviews. Also, it comes with an in-built form which is fully customizable and it actually helps you decide on the fields that you want to include in the form for your customers to fill. Also, it has built-in spam protection. Apart from that, it allows you to use shortcodes and use the testimonials as widgets. It allows users to use shortcodes for inserting reviews and inserting review form on any page or widget. 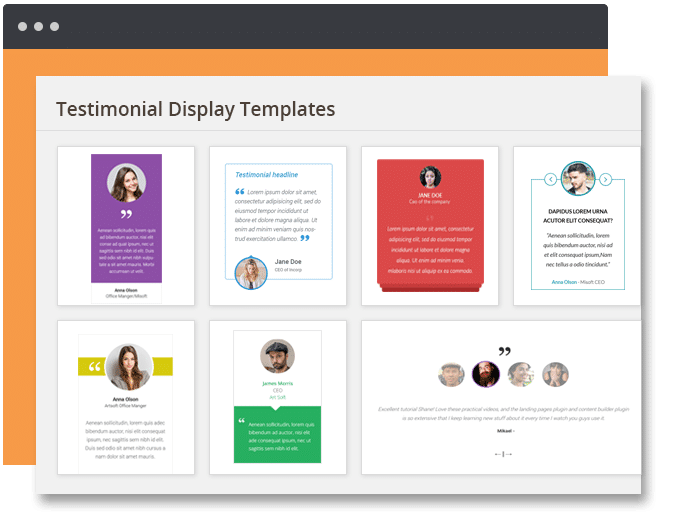 The Strong Testimonials is a free Best WordPress Testimonial plugin that offers users a collection of stunning templates to choose from. The plugin is especially good for non-technical WordPress users and is not complex at all. The multiple display options comprising testimonial slider, grid layout, masonry layout, single column layout, and more allows users to display testimonials is a very visually appealing way. It offers a customizable front-end form to collect customers’ reviews. Most importantly, it supports shortcodes. Also, it supports testimonials filters with the use of tags or categories. Apart from that, it allows users to set email notification and configure the anti-spam options. The Easy Testimonials is indeed very easy to use Testimonial plugin for WordPress and the plugin has the right mix of the basic and advanced features. It has over 80,000 downloads so far. The plugin is available in both free and paid versions. The plugin allows users to display testimonials on their sites as a customized widget. It works pretty much like a blog post. Just as the other testimonial plugins, this plugin allows you to add the reviews or testimonials on any page or post using shortcodes. Also, it allows users to generate their own shortcodes from the settings with the custom display. Also, it offers cool transition effects available for the widget. It allows you to choose from a huge selection of fonts, colors, and sizes! This Best WordPress testimonial plugin is available in both free and premium versions. Using this plugin, users can primarily add testimonials to any post or page via shortcodes or sidebar widgets. You can actually display all the recent, old or any random testimonials by configuring the plugin in your desired way and using shortcodes. Most importantly, you can filter the testimonials by category or tag. Also, it allows you to edit a number of settings for each testimonial. On top of that, it offers a feature called the transition carousel which actually allows you to add sliding and fading animation. The premium version obviously offers you more than this with some cools features like catching, adding excerpts, testimonials submitted by users, RSS feeds etc. Needless to say, testimonials have immense power and can largely improve your sales. This is the reason that testimonials plugins are extensively used these days. However, it is important to choose a testimonial plugin wisely. Choose the one that you find most convenient to handle and that helps you display the testimonial just the way you want. I have tested all of the 5 Best Testimonial Plugins For WordPress that I mentioned in this post and I personally liked the plugin, Thrive Ovation a lot for the reason that it offers a very balanced and wise blend of some of the most powerful features. I firmly believe it is the most well-conceived model and using this plugin can largely help in getting more sales. For those who want to give the Thrive Ovation plugin a try, I suggest you better choose the “Advanced” plan as it comes with 5 licenses.